Stoke boss Tony Pulis plans talks with Asmir Begovic after the keeper's claim he did not refuse to play in the Carling Cup win over Shrewsbury. Pulis said Begovic told him "he did not want to play" but the player has described his manager's claims as an "absolutely disgraceful accusation". "I'm disappointed he [Begovic] has said that it wasn't him who decided he wasn't going to play," said Pulis. "I think that is desperately disappointing and I will speak to him." 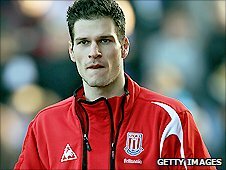 Bosnian Begovic, 23, joined Stoke from Portsmouth on 1 February, 2010 for £3.25m but has been linked with a move to champions Chelsea during the summer. "He's a good kid and he has been smashing ever since he joined this club, but something has turned his head," added Pulis. "It happens now in football and he is not the only one it has happened to - people blow in their ears, outside influences, and sometimes unfortunately they overstep the mark. "I think you have to be strong enough as a football club, no matter how much pressure is being put on, to stand up at times and really protect your club." Begovic was expected to deputise for Thomas Sorensen in goal for Stoke against League Two outfit Shrewsbury but, instead, Carlo Nash was between the posts for the 2-1 victory. What are your thoughts on Begovic's actions? "He said this morning he did not want to play," Pulis revealed after the match. "I find that very disappointing. We pay his wages and he has a responsibility to the club." But the player insists that he did not go as far as to refuse to play. "I spoke with the manager in private because I thought that was the respectful thing to do. "I did not want to do the cowardly thing and feign an injury or illness." When asked if Begovic's actions would push the keeper closer to an exit from the Britannia Stadium outfit, Pulis replied: "With our chairman [Peter Coates] it is less likely. I do not think Peter will be pushed around. "We won't be giving him [Begovic] away and doing a deal because of what he has done. "There has been interest from one or two clubs but nowhere near our valuation. We think he is a good goalkeeper and we want good players."